When the framing and wiring was finally finished up we contacted the guy we'd set up to do the drywalling and from that point on mostly other people were going to be doing the work and the work they were doing should have had fairly straightforward amounts of time to complete their task - so we figured the drywalling would be done last Friday and then we'd have a week to paint and so booked the flooring guys for the following Monday morning. They said three days to get done what they need to get done - and should be left for a few days to cure before anything else happens. So we let the Cabinet Maker know he could start installing the following week. The day after he comes in to install the first boxes, the countertop people will be in to take their measurements and make a template and then they said they'd need two weeks to get it done and they should be in on the 18/19 of December - which leaves a pretty tight window to get it all done before Xmas - but yesterday we did settle on a tile for the backslash and the tile people said it should take 2 weeks - maybe 3 to arrive and they'd have no problem coming in the 20th and 21st to install and then the plumbers should be in to install the rest of the stuff on the 22nd or 23rd! WHEW! 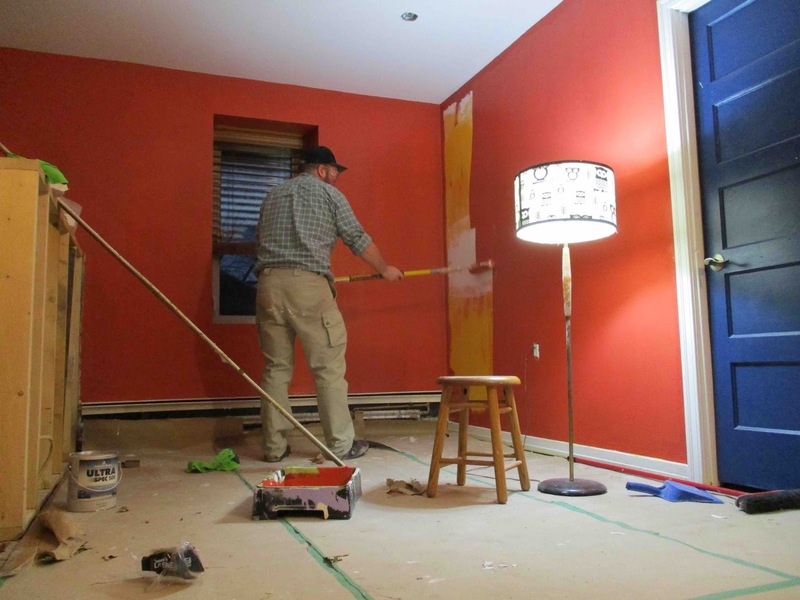 but that all hinges on us being done the painting by Sunday evening - so those flooring guys can be here at 8am. Monday morning. There were a few setbacks in the drywalling. The drywalled was in a little car accident (he's okay!) but that and other little hiccups set him back nearly a WEEK!? He only finished up Thursday evening - and had to do a few little patches of mud to smooth a few spots out - which Amanda and I had to sand down on Friday. 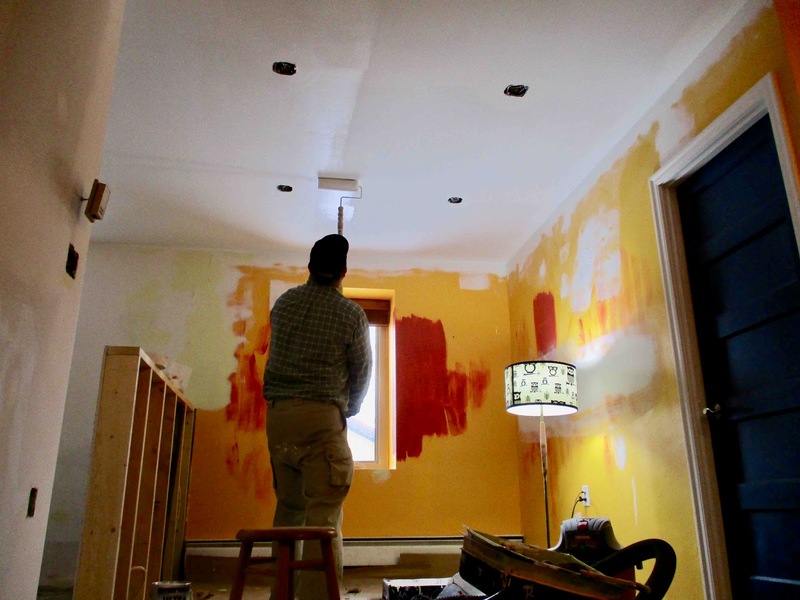 First coat of paint on the ceiling. 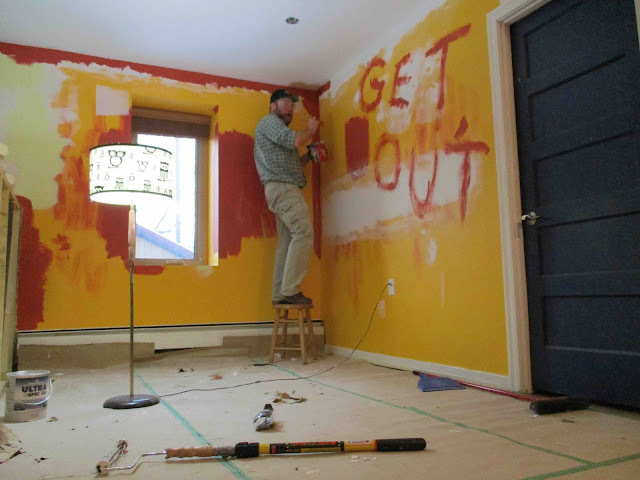 That reddish colour is called Dragon's Blood - we were assured by the paint store, however, that it was entirely synthetic and no Dragon's were harmed in the manufacture of this paint! But then I WILL be DONE all of the stuff I'M doing for the project. After that it's pretty much other people for everything else! The final wiring won't be completed until the 7th of December, however, so we still won't really be able to set up the new Dining Room table until then - and the stove and Dishwasher won't be going in until after the counter tops are done, so we really won't have a completely finished and functional kitchen until Xmas... Ah well... At least it will be done for the Holidaze and we'll have a new (to us) table and and some comfy chairs to sit up to it and play all our new (and old) games!! Hopefully the next post will be back to the regular type of painting! Well... assuming I go with 3-squad platoons, the first one is complete. I've been back and forth on how to organize them. 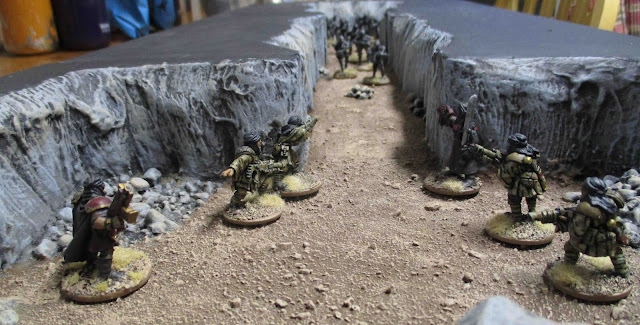 I have enough figures that I could field a company five full platoons of 3 infantry squads plus assorted special weapon and heavy weapon squads - when I ever get to painting all of them. 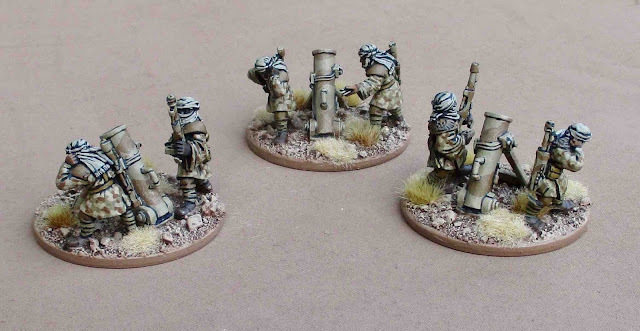 This Squad of Astra Militarum Tallarn Infantry - miniatures are © and TM of Games workshop, painted by myself and posted here entirely without their permission. The entire force so far... Currently sitting at about Power Level 28 and maybe about 380 points...? I have enough infantry to field FIVE of these platoon. I also have three more Special Weapon squads (Two Melta and another Plasma) and PILES of Heavy Weapon Squads I think four armed with Lascannons and another four armed with Autocannons and two with Heavy Bolters...? To that I should be able to add three squads of Tallarn Roughriders. This should fill out a "Brigade" Detachment - and then some - probably a "Battalion" Detachment (or a second Brigade)??? On top of all that Light Infantry - I'm also planning to add an armoured force of four Leman Rus tanks and a pile of Scout Sentinels, and possibly a Super Heavy tank (or two!?) I don't know... We'll see. I should concentrate on painting what I've got so far. 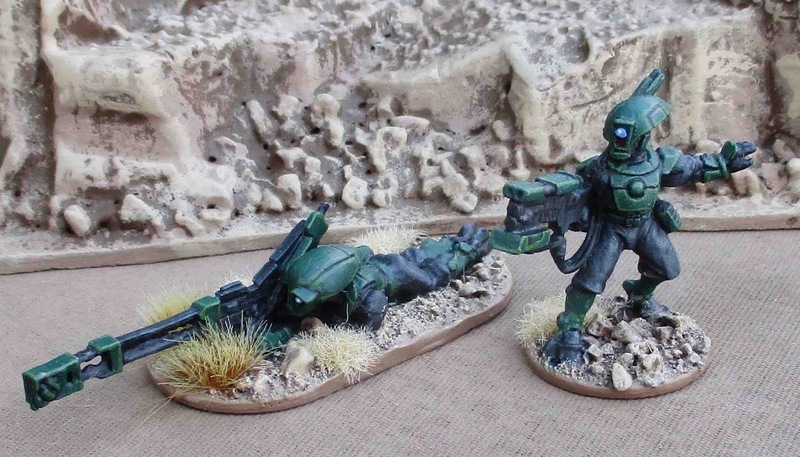 I also painted up these two sample Tau Pathfinders - to try out the colour scheme I was toying with. I'm not sure... It does look better in this photograph I took out in daylight than it did in my basement painting corner. 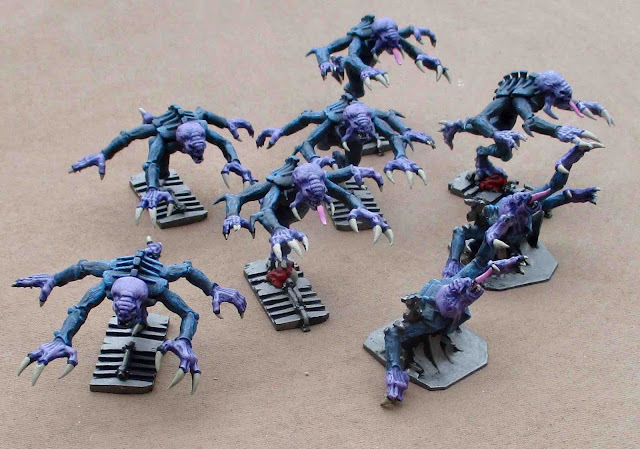 These are for Amanda's Shadow War: Armageddon Kill Team - when I was describing the factions to her she liked the idea of what I described as "Galactic-Space-Commie-Aliens". I had five of these I picked up a while back along with a devilfish transport - since she decided to play these I picked up another small batch to fill out a Kill Team of 10 - plus have a few options for weapons. Oh, I also went back through the blog and tallied up all the stuff I've painted and updated the 2017 totals. Looks like I'm in the red so far this year... Hopefully be the end of the year I'll be slightly ahead... I was a little shocked at how many figures I'd bought this year... I did buy a lot of Great War stuff early in the year - and got ALL of it painted (even though the Vimy Project was kind of killed...). Then on top of that the Bones 3 Kickstarter arrived, and I back two Lead Adventure Kickstarters (Dwarf Gold Fever and Astropolis II) and then I bought TWO large batches of 40K Tallarn minis (those alone totalled over 200 minis..) and I did order a few ECW things in the spring when I was getting a lot of that painted up. 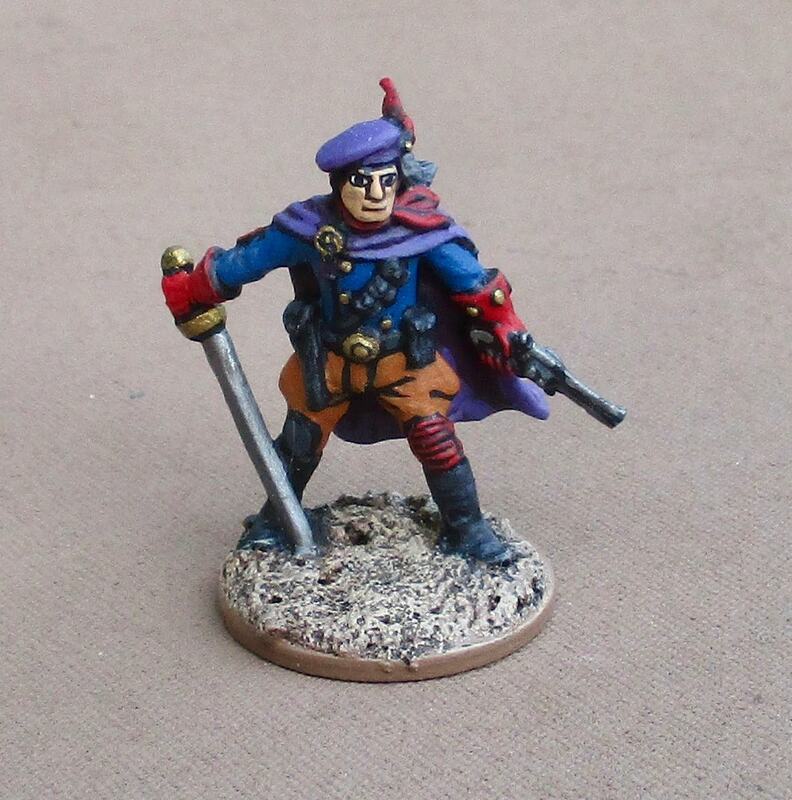 Of those 652 28mm foot figures I've painted so far this year, 148 of them have been 40K (or other Sci-fi) figures, 236 of them were for the Great War, and 183 were for the English Civil War (there were also 46 fantasy, 23 modern, and 28 post-apocalyptic). At the front of the workbench I have the Tallarn Roughriders ready to go next. After that I should probably get a company commander painted and then start in on the next infantry platoon. I do also have a Leman Rus and Scout Sentinel lurking at the back of the workbench that I've been occasionally been putting daubs of paint on, but I'm kind of waiting on a couple packages of stowage materials (extra gas cans and kit that I want to have strewn about the vehicles, hanging precariously off every side) before I get too much painted. Pan-Dimensional Mercenary, Commissar, and MORE Tallarn. The figure is from Miniature Figurines. This fellow is actually from Lead Adventure Miniatures - I picked him up in the Astropolis II Kickstarter (He was actually released in the first Kickstarter, but I had had to pass on that one, so I picked him up in the second Kickstarter). 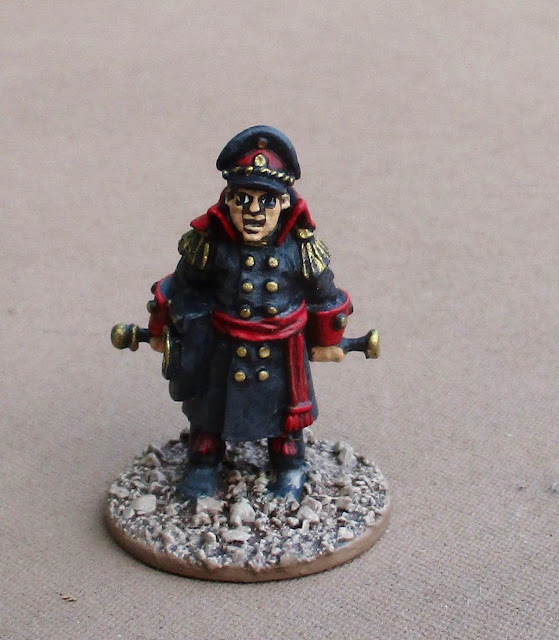 I think he's supposed to be the first officer of the Astropolis, but I thought he'd make a PERFECT Commissar for my Imperil Guard. 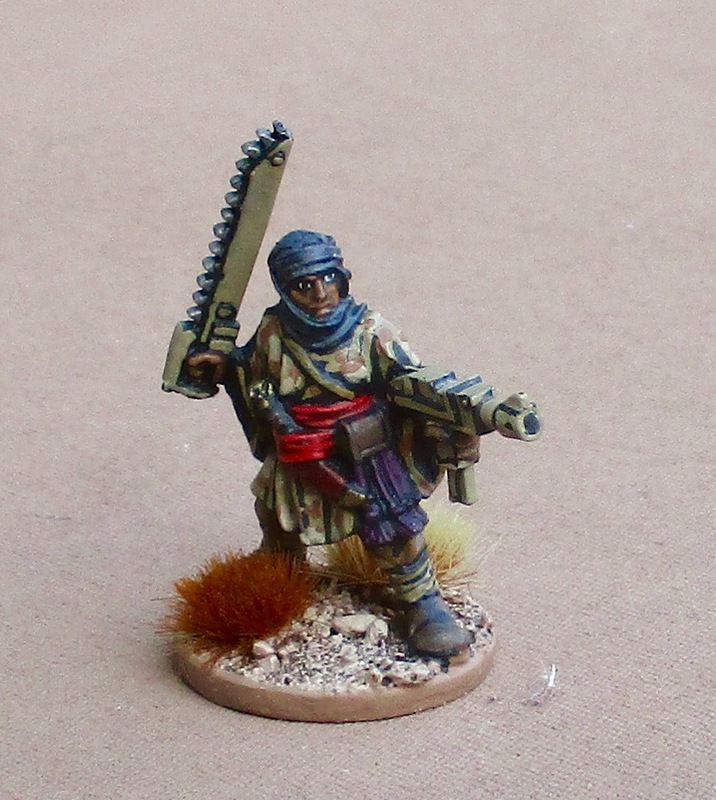 A Tallarn Veteran Sergeant - a Gen-u-ine Games Workshop miniature. 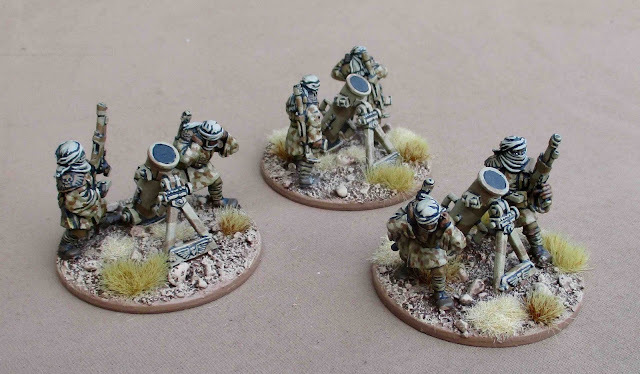 and finally a Heavy Weapon Squad for the Tallarn - armed with Mortars! I had pretty good luck with the Mortars against Finnegan's Orks in our last little skirmish, so I thought I'd start off with these for some Heavy Support. 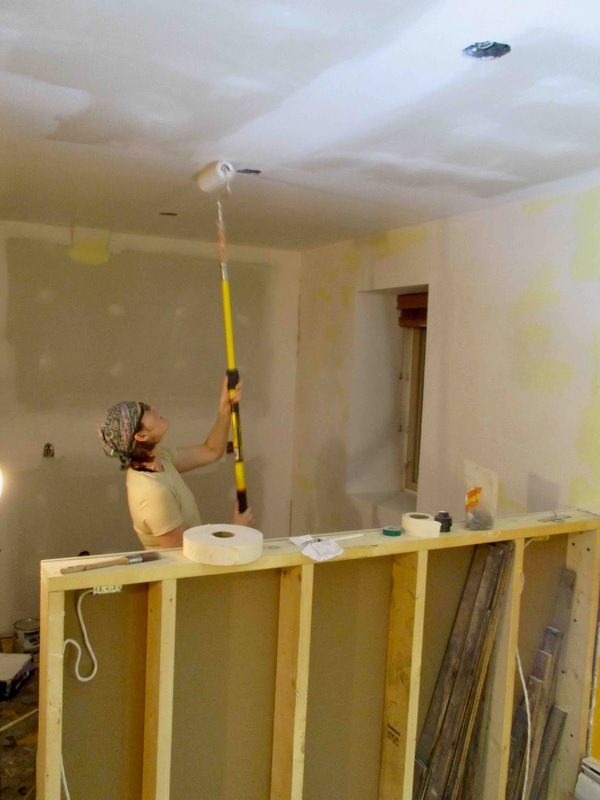 the Drywall is up in then kitchen. Mudding should be finished by Friday and over the weekend we could potentially be painting. After that things should move along fairly quickly - the flooring guy should only take a couple days, the cabinet maker is just waiting on us, so as soon as the flooring guy is done, he'll start installing stuff and then we need to get the countertop people in and then the plumber again to finally hook things up. Should all be done well before the Holidaze. I have a half finished Infantry Squad of Tallarn on the workbench that will probably be my next priority. After that? Probably the squad of Roughriders! Also on the workbench is a half painted Leman Rus Tank and a Scout Sentinel, assorted Astropolis figures, and just yesterday my friend John added some Adeptus Mechanics Skitarii Rangers and some Shadspire minis which he asked me to paint up for him. The Skitarri Rangers are for his Shadow War: Armageddon Kill Team as I will be starting a campaign of that in the new year. After the kitchen is finished I think I'm going to be doing some minor renovating in the basement - no walls being torn out or anything - just hauling everything out of the game room, building some new shelves, maybe putting in some new lighting, reorganizing the whole mess and such. 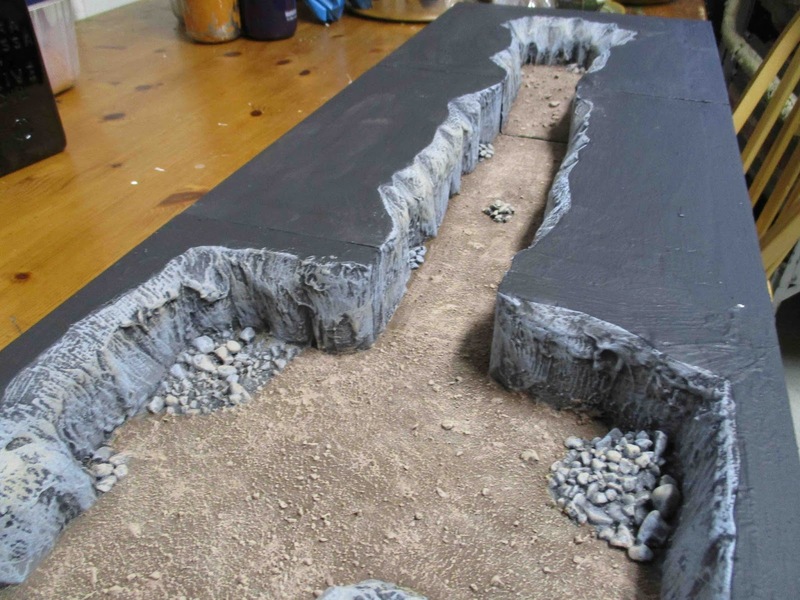 Hopefully it will all be done by the end of January - in time for the Winter Wargaming Weekend. 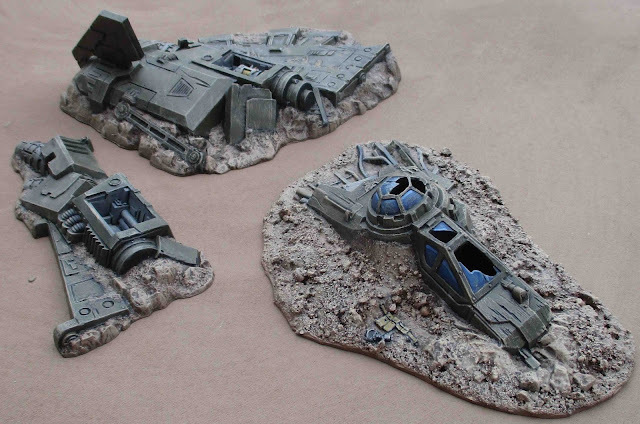 First up - the crashed Aquila Lander. This is a lovely little bit of terrain from Games Workshop. It came with the boxed set of 40K a few editions back. My friend Other Tim was still playing 40K at the time and bought a couple boxes (as the boxed sets are relatively good deals) and had a spare set of these that he passed on. As I've been playing 40K lately I thought I'd dig them out and quickly paint them up for some 40K specific scenery! I wish I could say this is a good chunk of them done, but I have two more batches of genestealers this size to finish AND a dozen Space Marine Terminators!? I am determined, however, to get these all done before Xmas break - So we can play a bunch of it over the holidaze. It's be REALLY embarrassing if I didn't get them done before they release ANOTHER new edition!? I was really torn about whether to base these or not... They're awfully wobbly and tippy as is. They're really big, though and it would be really awkward to try and fit them on 25mm bases - which would fit in the 25mm squares of the terrain tiles. I have some 30mm rounded edge bases that look like they'd be wide enough to offer some stability, but then they won't fit in the squares on the board. Mind you, these guys on their own don't really look like they'd fit in the little squares on board as is!? The Terminators are and even worse - like modern terminators, the models are really designed for 40mm bases - tell me how the hell THAT is supposed to fit on the teeny, tiny 25mm squares of the board!? Anybody else have any experience with trying to base the figures from Space Hulk (Fourth Edition)? I have a bunch of Tallarn on the painting table at the moment... as well as some Eldar... and some Tau... and some Inquisition stuff... and a bunch of the Astropolis II Kickstarter stuff in various states of painting (most are based and primed...). I've decided that for the Winter Wargaming Weekend/Wargaming Birthday Bash in February will be a Shadow War: Armageddon campaign - hence the disparate factions inhabiting my workbench at the moment. Rather than setting in on Armageddon, I'll likely set it on Brind's World - the various factions, rather than searching for promethium caches, will be searching the jungles and caverns for archeotech left behind by the ancients that once inhabited the planet. 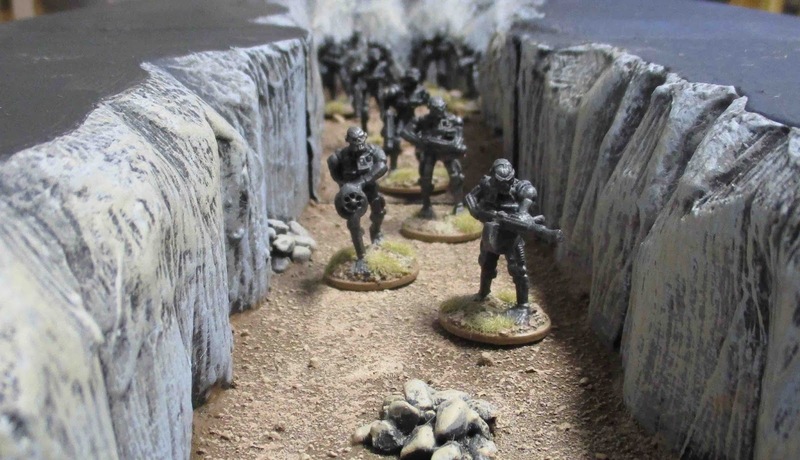 the next thing you're likely to see here, however, is some more Tallarn - I have an infantry section (to finish up the first platoon) and a heavy weapon section on the go. 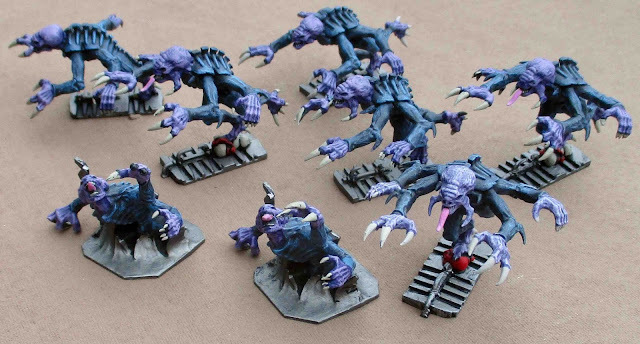 Then hopefully some more genestealers... and caverns... and maybe some game reports. 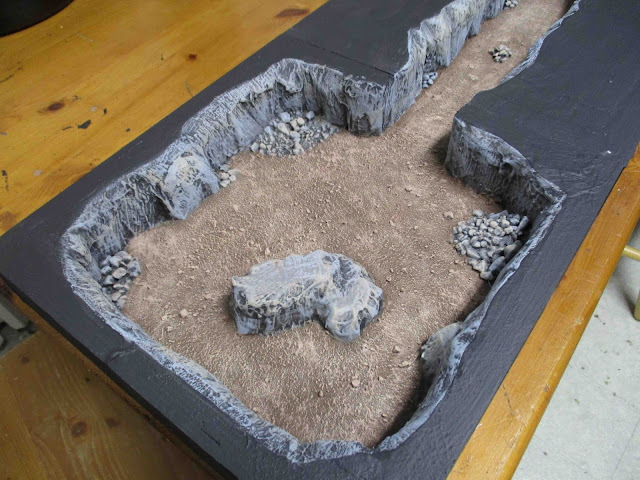 These are the first three of a series of modular cavern terrain tiles I've been working on. (Looks like I need to touch up that black a bit...?). I've cut bases and sides for sixteen or seventeen 30cm x 30cm square and three or four 30cm x 60cm. 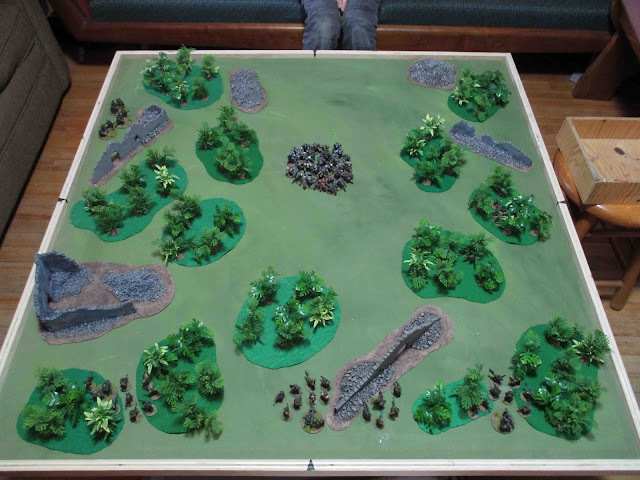 This will give me enough to easily fill a 120cm x 120cm board (~4'x4') - with some options - for a decent sized skirmish. I could use them for just about any setting from dungeon-bashing-fantasy to science-fi - but as I'm sick to death of fantasy stuff, I've been mostly thinking of sci-fi scenarios as I build them up. As they are uniform in size, my plan is to cut a bunch of 30mmx30mm cardboard squares so that I could cover them all up and potentially have players only reveal squares as they move into them. I was going to build a ladder for the Dead End tile so it could be used as an entry tile. Stay tuned as I hope to finish these up over the next month or so and have it as an option for a skirmish campaign I hope to launch in the new year. 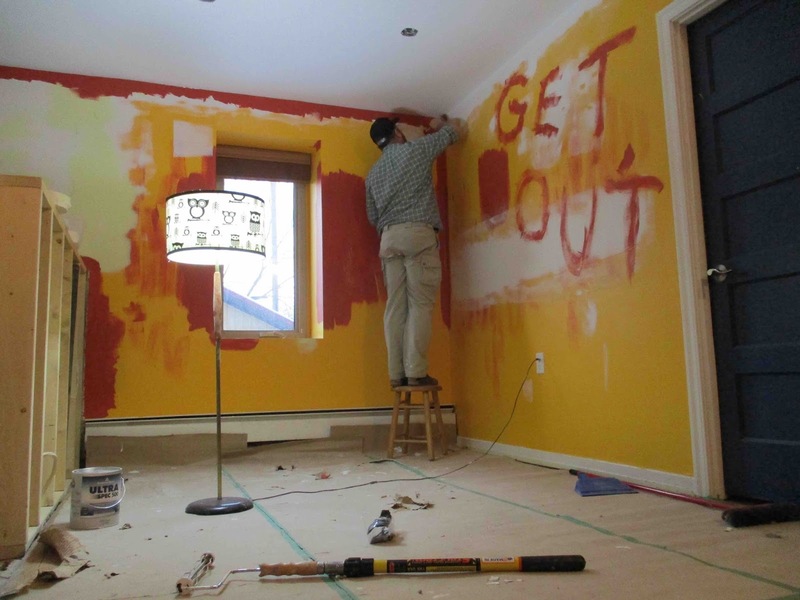 I wasn't sure if I should do the walls and the floor the same colour. I ended up deciding to do them different - mostly for a bit of contrast. I'm not totally sure if I'm going to keep them this way. I finished up a second Infantry Squad for my Tallarn Desert Raider force. Some tanks... 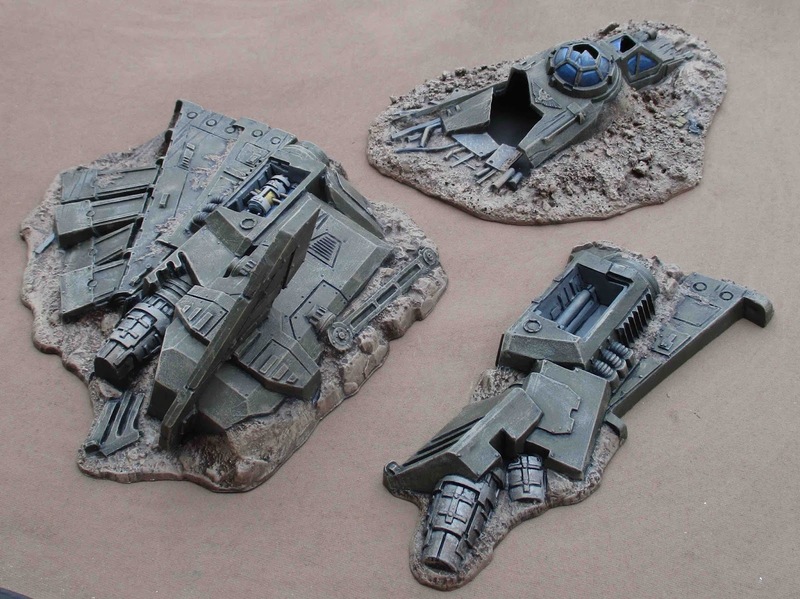 I have two Leman Rus tanks (on assembled and partly painted, the second still on the sprue) which I will paint in Khaki and use as Tallarn armour. At SOME point I wouldn't mind picking up 2-3 more to fill out a Spearhead Detachment of Tallarn armour. I still have three KV-2s and assorted bits to convert into Regnarok tanks but I'm not sure if I'll paint them up as Tallarn (I've been thinking of doing them as Valhallans...? Because, you know, that'll be the NEXT Guard army I put together when I ever get these done!?). Anyway, without any of the armour, I'm sitting at 2600 points of stuff. Not that I'd field it all together - but it gives me lots of OPTIONS. I'm not sure how I'd field the whole company all together...? a "Brigade Detachment" has only 12 spots for "troops"... 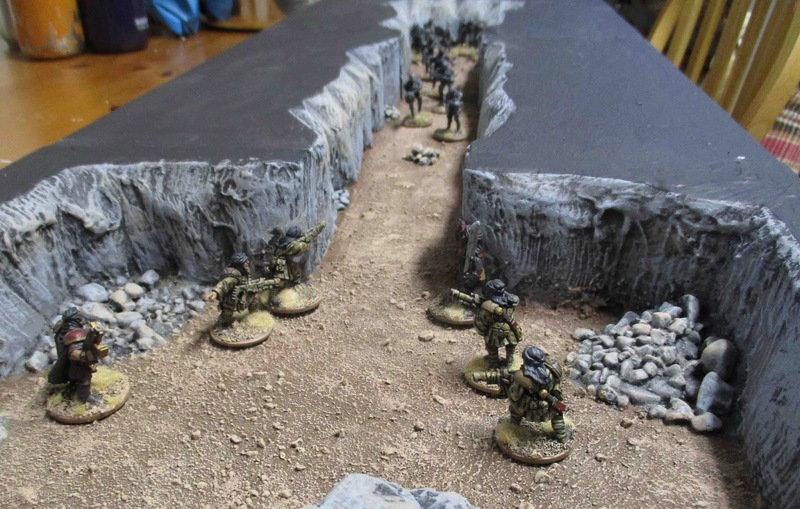 I guess I could do a Brigade AND a Battalion detachment - which would be 15 Command Points! But I'd have to come up with another HQ option or two...? A second Company Commander seems silly when I'm only actually fielding a company. I guess the second Company Commander could - fluff-wise - be called the 2.I.C. or something...? After all that boardgame playing in September, we didn't actually play ANY boardgames in October. Oh, we played games - it's just that none of them were boardgames!? (okay, there were a few boardgames we played on the 1st of October on the last day of ToonCon, but they were included in the Tim's ToonCon 2017 Report, so I consider them kind of separate). 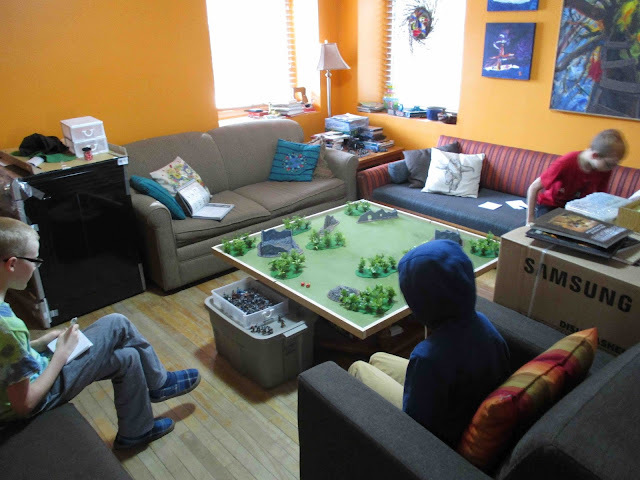 We did play a fair bit of Warhammer 40,000 (8th Edition). 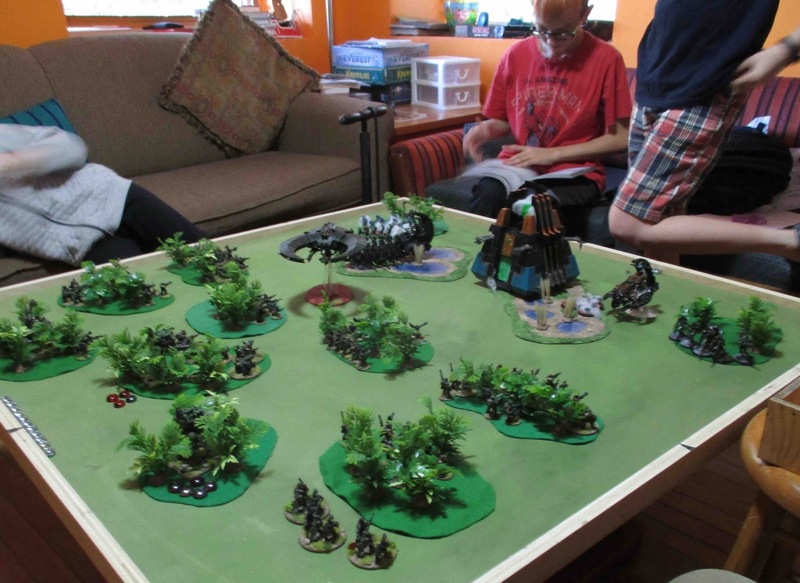 On the 14th we tried a big Power Level 70 game of Necrons versus my Guaiacan Commandoes. Too big of a game, we only finished one turn. The following Thursday (19 October 2017) we tried again - this time with smaller forces (Power Level 18). This time we got in two full games - each of the kids took on their friend's smaller force of Necrons. On Saturday Finnegan and I tried another quick game and I started to try and weave a bit of a narrative together to explain these games. Finally we got in one more game on Monday, 23 October 2017. This was Orks versus Tyranids. In addition returning to Warhammer 40,000 I also returned to running a role-playing game! It's been over three years since I last ran any role-playing games. I have been playing in a few run by my friend Bruce - he ran us through the Masks of Nyarlathotep campaign using Savage Worlds (which took about a year and half) and for the last year and a bit has been running a D&D 5e campaign set in Primeval Thule. 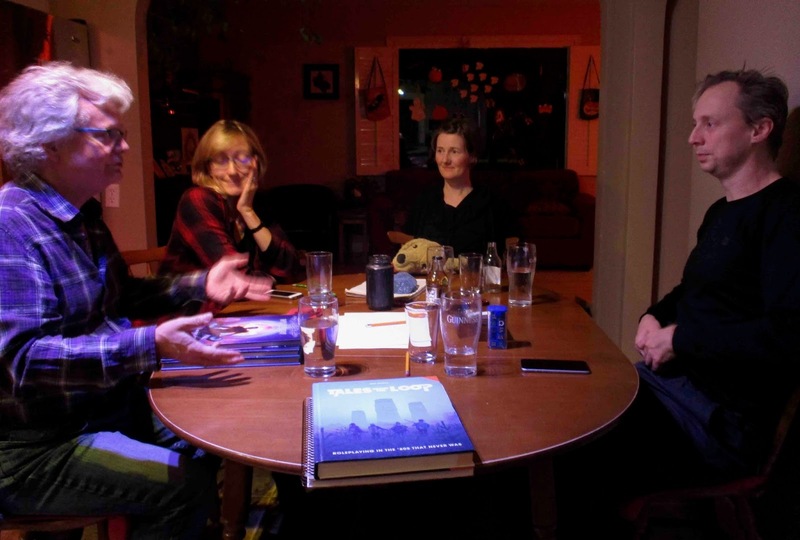 We had initially made some characters for Tales from the Loop in August or September, but when we actually got to playing this month, two of the initial players had to drop out and another joined us. So the first session was mostly making a new character and redefining relationships. I did briefly introduce the Mystery to the kids at the end of the first session. I am running the Four Seasons of Mad Science campaign out of the book and started them on the first Mystery: summer Break and Killer Birds. In the second session the kids continues the adventure, starting to piece together bits of what it going on - but also going off on a few tangents. The next session - this Saturday - They should be able to finish it up. The plan is to run four more session - two in November and two in December - and then we'll see where we're at. It could take a bit longer than that for us to run through the entire Four Seasons of Mad Science campaign, so we may continue into January. I don't expect we will continue after that, but who knows. I would like to get a 40K RPG campaign off the ground - either Only War or Rogue Trader. Or possibly BOTH - with different groups! The renovation is likely to drag on into December, but the hope is by Xmas we'll have a kitchen and dining room on the main floor again and hopefully a new dining room table to play board games on. In the new year, after all the kitchen renovating is done, sights will be turned to the basement Game Room - which has been, more or less, in a state of disaster since the last renovation 4 years ago... Once I can get all the extra stuff stored in there out, there will be a major clean out and reorganization. The old, purpose-built game table is going to be dismantled and a new (to us) table Amanda found on Kijiji is going in there. It's a proper table (unlike the current one, built out of 2x4s and 3/4" MDF) with 6 big fancy comfortable chairs. 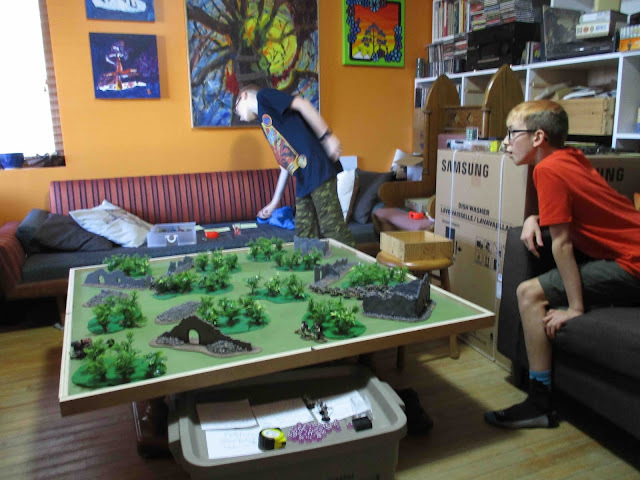 the table itself is just over 1m wide by just over 2m long - so a bit smaller than the old gaming table, but it's just as solid and while miniature gaming can still be done on it, it's more suited to boardgames (and role-playing games) which we do far more often these days anyway.